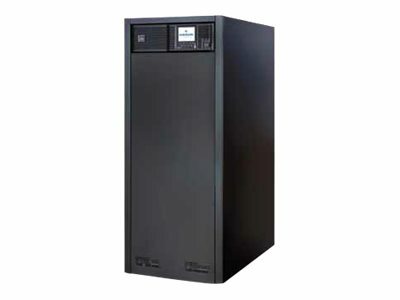 The Liebert NXC offers reliable and flexible secure power in a fully integrated package solution. Its highly efficient transformer-free double conversion technology delivers installation and running cost savings. With a rated output power factor of 0.9, Liebert NXC is also able to provide greater active power than a traditionally rated 0.8 power factor UPS. Liebert NXC achieves up to 95% efficiency in double conversion mode and up to 98% in Eco mode, thus ensuring effective load protection, while reducing the total cost of ownership (TCO) and efficiency environmental impact. Liebert NXC’s combination of performance features, impressive integrated autonomy and compact footprint make it ideal for guaranteeing clean, continuous power for a wide range of applications from IT and manufacturing to retail and transport. Its low THDi (< 4%) and active input power factor correction ensure that the current absorbed from the upstream distribution network is near equal to its nominal output current, hence eliminating the need for oversizing gensets and other equipment. To ensure superior protection for critical loads, the Liebert NXC has been designed to optimize specific rating requirements, thus enhancing flexibility and installation space needs. Liebert NXC features a multi-lingual LCD user interface allowing close control and monitoring of system status and performance. The UPS offers voltage-free contact ports, USB interface, optocoupler based interfaces, intellislot for SNMP, Modbus or Relay communication. These communication capabilities make Liebert NXC compatible with any building management system.